Product Code – Assign a code to the product. Description – The description of the product code. Margin – The lowest margin that this product code should be sold for. 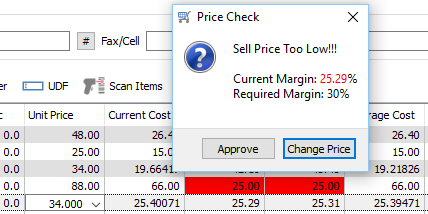 If the user sells for less than this margin, the sales order line margin will appear in red. A message can be set up to notify the user they are selling below margin. This message is set up in Company Settings/Sales Orders/Messages/Message. It can be set to pop up on a sales order and/or POS. The user can choose to accept the price or edit it. Surcharge – The surcharge is calculated based on the percentage put onto the inventory product code. It can be overridden by the user. Dept – The sales department that is usually connected with this product code. 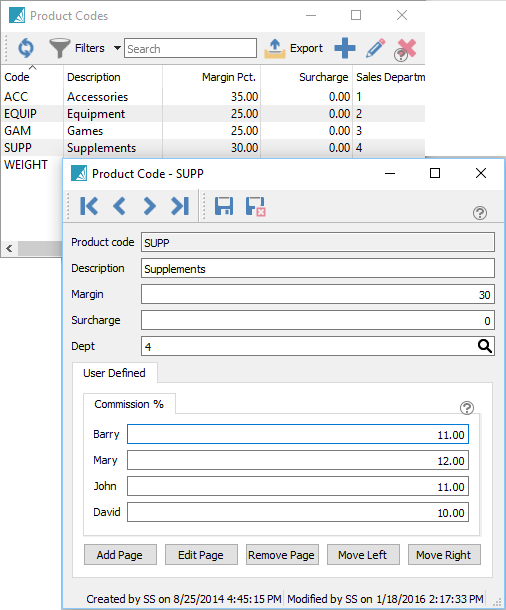 If there is a sales department added here, and the user changes the sales dept of an item, they will be prompted if they want to change the product code to match.